^ Palmer, D. (編). The Marshall Illustrated Encyclopedia of Dinosaurs and Prehistoric Animals. London: Marshall Editions. 1999: 157. ISBN 1-84028-152-9. 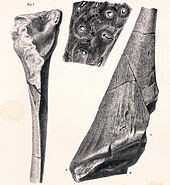 Nopcsa, F., 1928, Palaeontological notes on Reptiles: Geologica Hungarica, Series Palaeontologica, tomus, 1, -Pasc. 1, p. 1-84.